Face the elements in style. These embroidered booties feature a Barefoot wool-blend sock, faux fur lining and a water-resistant suede upper so you can stay warm, dry and fashionable in any kind of weather. I loved this boot. I sent it back as I was getting the Gabe Sporto boot. It was a hard choice since I really wanted this color. I thought the boot fit well and was pretty happy with it when I tried it. I did notice that the tan in this same style somehow felt like it was a little more substantive, it felt firmer around my foot and I wanted that little extra support when wearing. I figured maybe the die process changed the suede ever so slightly. Very hard decision to choose. I cannot say enough good about these booties. They hold up so well, absolutely true to size, and so comfy. 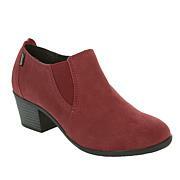 Compliments everytime I wear them, particularly the burgundy. I have 4 total. Two pairs from a couple seasons ago, one in a color that wasn't available in the "relaunch" this season, that even though well-worn, look as good as my new ones. If they came in more colors, I'd buy those too! Love the name, Joy! Wear them to work daily on my feet all day and still feel great. Highly recommend! 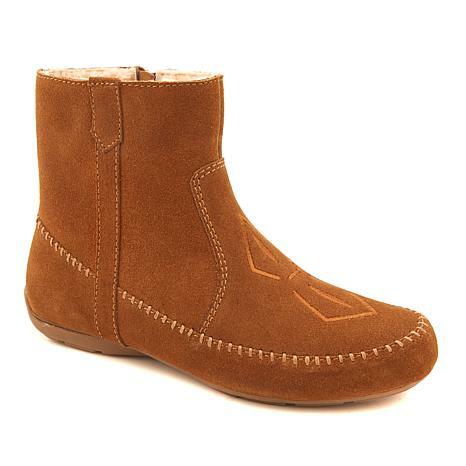 I loved these boots so much I bought a 2nd pair in a different color. Both pair were great out of the box. I had no issues at all. I am a 6.5 in most shoes and these were not tight or too loose. 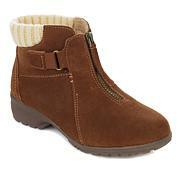 We seem to be having rainy and cold winters lately so this boot works great including the sole.